The CHB150W8 series offers 150 watts of output power with high power density in an industry standard half-brick package. 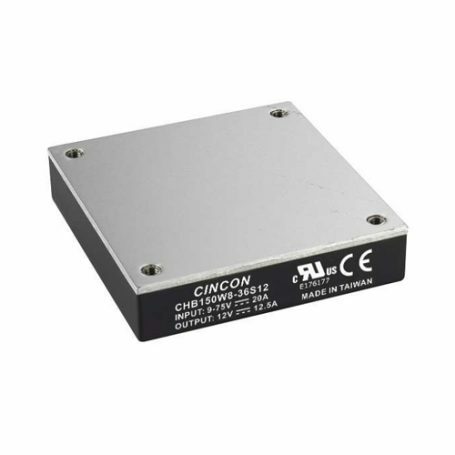 The CHB150W8 series is wide (8:1) input voltage range of 9-75VDC (covering 12V, 24V and 48V battery voltages) and provides a precisely regulated output. This series has features such as high efficiency 1500V dc isolation and a case operating temperature range of -40°C to 100°C. The modules are fully protected against input UVLO (under voltage lock out), output short circuit, output overvoltage and over temperature conditions. Furthermore, the standard control functions include remote on/off and output voltage trimming. All models are highly suited to telecommunications, distributed power architectures, industrial, railway system, and mobile equipment applications.